Of the announced features, which are you looking forward to most? What else do you hope to hear added in the future? Continue on to see the revealed game info for EA SPORTS UFC 2. Having a solid training camp and team to work with can help you win your next fight. Prepare for next fight by balancing your regiment to gain the greatest edge without risking injury. For the first time in a UFC game, create a female fighter and guide them to UFC greatness. First, make your name in The Ultimate Fighter. Then, fight your way through the ranks in the hopes of becoming the next UFC Champion. Along the way, meet career-defining moments that will make your journey even more unique. From epic battles to long-lasting rivalries, your path to the championship will be a memorable one. For the first time in an MMA title, EA SPORTS’ popular “Ultimate Team” mode is coming to EA SPORTS UFC 2. Create. Compete. Collect. Customize. Create your team of up to five fighters in different weight classes using EA SPORTS UFC 2's deep customization options. Compete in online or offline competitions to progress your fighters and earn coins. Collect coins to buy packs which deliver special items used to boost fighter performance. Customize your fighters with items from packs which improve or change moves, attributes and perks – all of which work together to sculpt your team members into the most explosive in the UFC. Throw away the grappling and unleash all the punches, kicks, knees and elbows in this fast-paced mode. The rules are simple…the fight doesn’t stop until someone gets starched! Become an event organizer and create the dream fight card you’ve always wanted. Choose from iconic venues, authentic referees, and custom fight settings. Once that’s all set, take control and bring the hype. Our Title Chase mode lets you test your skills against others from around the world for the shot at becoming a champion. Online features a division progression system to make sure you’re always facing off against a suitable opponent. Predict. Play. Win. Make your pick in the outcome of upcoming UFC events, then step into the EA SPORTS UFC 2 Octagon to make it happen. Win in-game rewards and propel yourself up the leaderboard of our immersive fantasy prediction game. Character customization goes even deeper with robust facial sculpting, tattoo customization, and the ability to create female fighters. EA SPORTS GameFace returns, allowing you to put yourself in the game. Jump into the all-new Practice Mode and learn everything from basic striking and grappling to more complex moves and skills to become the next best fighter. EA SPORTS UFC 2 offers 12 new mini-games that help players learn and perfect their stand-up, clinch, and ground game. With the new physics-driven hit reaction system, every knockout will feel different from the last. Fighters will fall in response to their momentum and the blow they receive, making each knockout feel responsive and rewarding. Dominate the mat like Ronda Rousey. From chaining your moves, quick transitions, and the ability to do standing submissions, there are more ways to defeat your opponent. Great names like Fabricio Werdum, Johny Hendricks and Demian Maia have always been incredible on the ground. In EA SPORTS UFC 2, we’re bringing the ground game to life with more variety and responsiveness, featuring freedom and control not seen in any previous MMA game. When you watch a fighter like Jose Aldo, who is able to frustrate an opponent by simply making himself unhittable, it can sway the outcome of a fight. In EA SPORTS UFC 2, we’ve put more control in how you’re able to defend yourself. Greater head movement lets you slip and dodge incoming strikes while our improved blocking and parry system will make your opponent think twice before attempting a strike. Using visual aids to help players, we’re making it easier to master the art of grappling. Happening in real-time, the grappling assist display shows you how to seamlessly move from taking down your opponent to submitting them, all while teaching you the nuanced elements of the sport. A new facial model rig, hair physics, and improved strike deformation bring a whole new level of detail to the game and work to make every impact feel and look realistic. EA SPORTS UFC 2 has over a thousand fighting and signature animations to bring greater personality to each fighter. You’ll automatically recognize iconic moves from some of the best fighters, like Conor McGregor’s high hook kick. 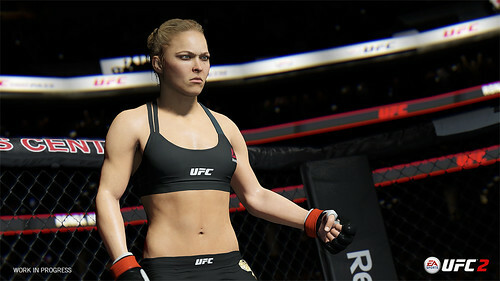 Building upon the strong roster of fighters in EA SPORTS UFC, there will be even more talent to choose from. From MMA legends to the current crop of UFC Athletes, and even some surprises, fans will have even more choice. Having even more fighters to choose from will be a key element for a number of modes, such as the all-new UFC Ultimate Team.